Like many little kids, Noah is a huge fan of dinosaurs. This summer we've even signed Noah up for a weeklong dinosaur camp. I am so excited for Noah and a little jealous I can't tag along. In the meantime, we are having lots of fun with dinosaur activities at home. 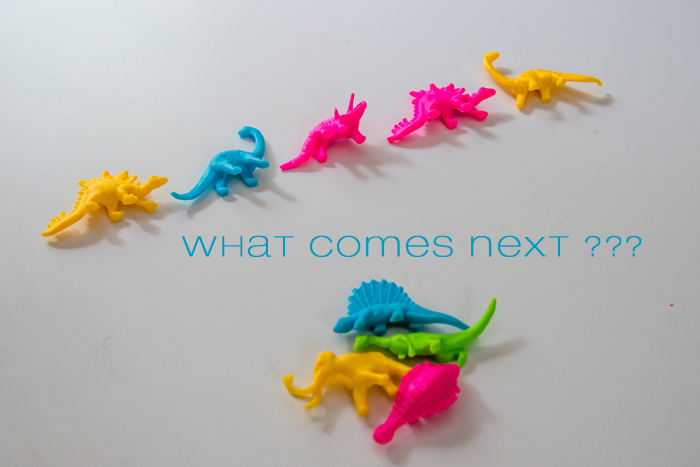 In addition to some simple imaginative play with his dinosaur toys, there are so many fun things you can do with dinosaurs... from arts and crafts to play based learning activities. 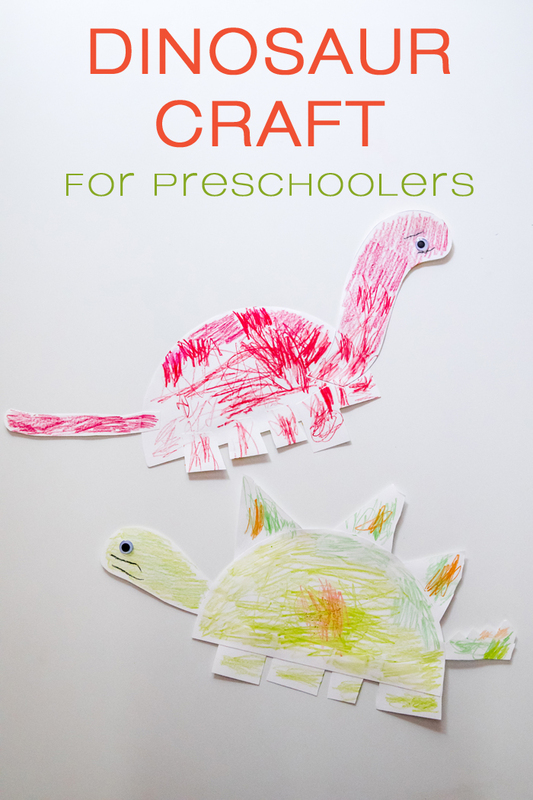 Here's a really fun and easy dinosaur craft you can do with your preschooler. All you need is some white card stock (or construction paper), scissors, glue, googly eyes, and either crayons or paint. While you could easily use a paper plate as the base, I find that it's harder to glue to a paper plate. Instead, I simply cut a half circle (using a salad plate to trace) out of card stock along with the rest of the body parts. And since Noah is getting really good at cutting, I let him cut out the spikes, legs, and tail. I cut out the body and the head because of the curves. While the spikes and the feet aren't perfect, I love that you can tell he made these himself and has so much pride in his scissor skills! He glued all the body parts to the body and then colored his stegosaurus and brontosaurus. As much as I love the pre planned crafts, I get really excited when Noah comes up with his own ideas. One afternoon, he said he wanted to make some dinosaurs. 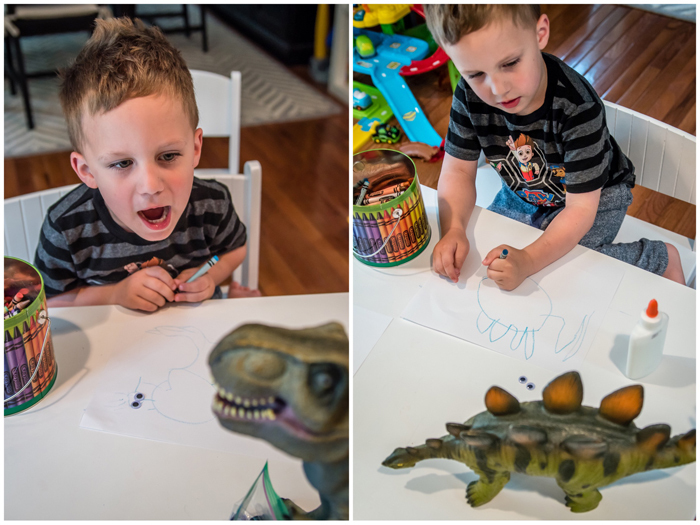 He grabbed his big dinosaurs to act as models and got to work with just some paper, crayons, and some googly eyes. I absolutely love Noah's creativity and his passion for art. and thank goodness for spell check because apparently I only know how to spell T-Rex! We have these two dinosaur puzzles (puzzles in a box | 24 piece jigsaw) and Noah loves doing them both. We love doing puzzles and I think it helps so much with fine motor skills while incorporating many of Noah's current interests. Melissa and Doug hands down makes the best puzzles. We've purchased other brands and I've noticed the quality just isn't there. 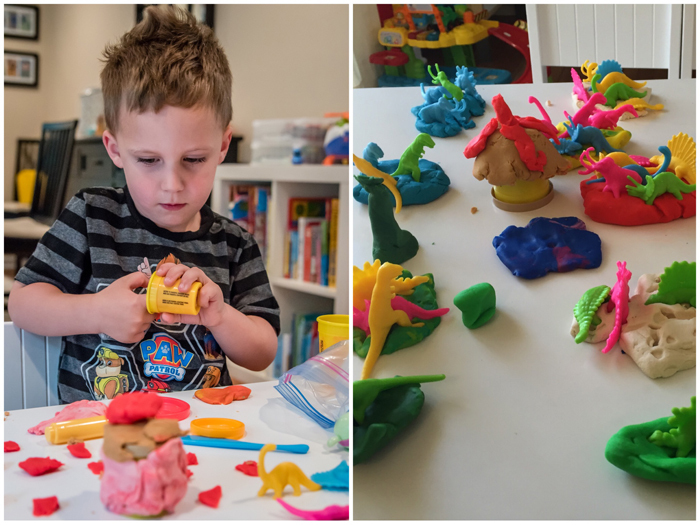 We are huge play-doh fans, so it was only natural for us to incorporate it into our dinosaur play. We found these little dinosaurs on Amazon, and while we could have chosen the more realistic colored ones, Noah was adamant that he wanted the neon version. Noah made a volcano complete with red lava and many islands for the dinosaurs to live on. Using the same dinosaurs, grab some paint and experiment with making footprints across a piece of paper. While crafts are always a lot of fun, there's nothing better than curling up with a few good books. 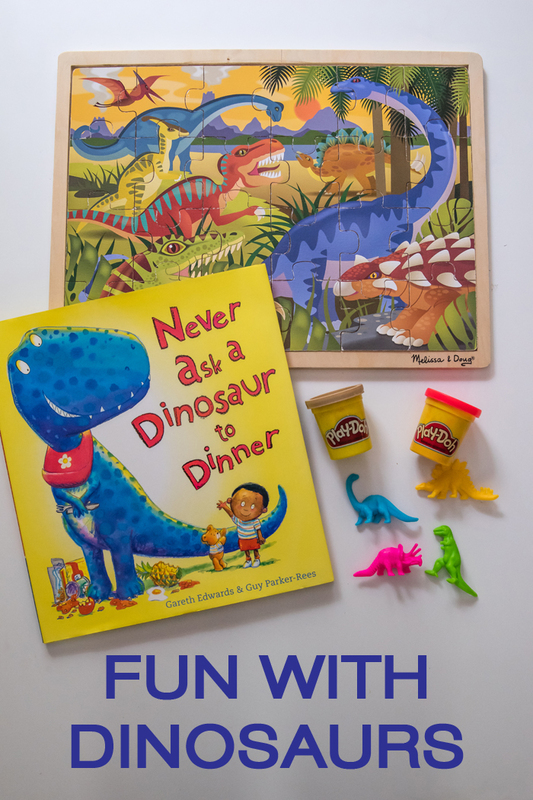 We are huge fans of the How Do Dinosaurs series after borrowing a few from the library and really love How Do Dinosaurs Say Goodnight? We also have and really enjoy Never Ask a Dinosaur to Dinner. While it is still over six months away, one of our favorite Christmas books is dinosaur themed. If you have a dinosaur fan, you should definitely pick up Santasaurus! I would love to add a few new dinosaur books to our collection and would love some personal recommendations. I perused Amazon a little and think Harry and the Bucketful of Dinosaurs and How Do Dinosaurs Play With Their Friends? look like they'd be really cute and fun. I know it's a TV show, but hear me out. I probably let Noah watch more TV than I should, but to my defense, most of it is really educational. Dinosaur Train is entertaining while teaching Noah (and me) so much about dinosaurs. I love that the show encourages kids to get out into nature and explore. Noah is very interested in patterns and points them out in every day life. When we got these neon dinosaurs, he quickly started making patterns all on his own. So we turned it into a game where we would start a pattern and ask him what color dinosaur would come next. I love finding fun ways for Noah to learn! While we didn't do this at home, Noah made some really cool dinosaur fossils and footprints at school using modeling clay and miniature dinosaurs. Here's a great tutorial on how to make your own fossils at home. Last summer, we did a dinosaur themed sensory bin with Noah's cousins. While I didn't take as many photos as I should have, here's a great tutorial. Fill a plastic bin with sand and rocks and then add some fossils (maybe even the ones you made above), dinosaur figures, and anything else you think you'd find in prehistoric times. Then give you child a spoon or small shovel and a brush and let them dig away! So tell me, do you have some little dinosaur fans? What are you favorite dinosaur activities?? Okay, those dinosaurs crafts are adorable! Liam has been particularly into dinosaurs lately too! You should start reading The Magic Treehouse Series to Noah. The first one is about dinosaurs! Love all of these activities Meghan! 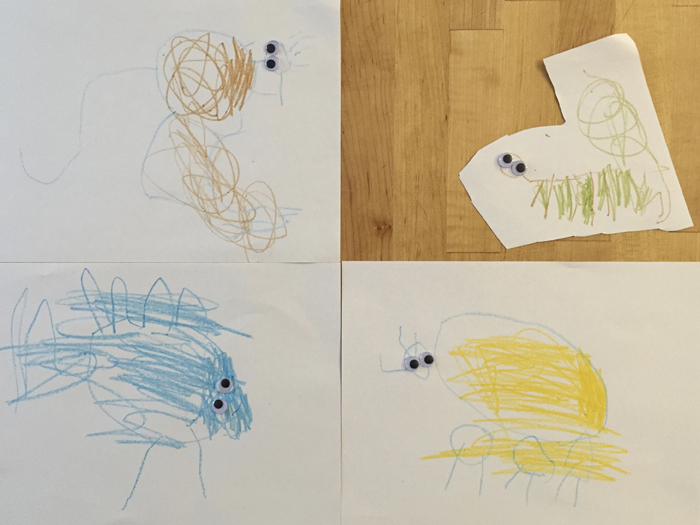 Noah's dinos are adorable that he drew. I love them. The playdoh fun is great too. We need to sit and have some dinosaur fun. Noah has some pretty awesome dinosaur toys too. Love! Simon used to love dinosaurs too. I think he still likes them, but he hasn't mentioned them lately! These are so cute! 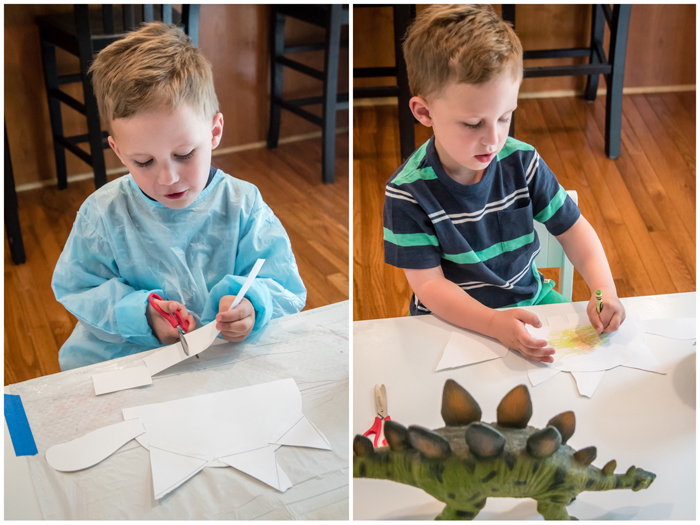 My boys would definitely love the dino cutting craft! So my kid is the weirdo... and doesn't so much care for dinosaurs. I am telling you so many "normal" kid things, Connor has no interest in! But I am thinking of stealing this idea and putting it to use. While he might not like them now, this could make him! So fun! You do such an amazing job coming up with activities to do. Love the dino theme. A dinosaur camp? That sounds like a blast. I am looking for a week-long camp I can send Mason to. Something fun he can do this summer. Love all of these activities. You guys always come up with the best activities for any theme!